Perhaps one of the most visually mesmerizing celebrations in the world, the Loi Krathong (also spelled as Loy Krathong) festival in Thailand is a favorite for visitors and locals alike. Without a doubt, Loi Krathong is the most popular festival for Thailand in fall. Thousands of small, candlelit floats are released on rivers and waterways as offerings to the river spirits. In Chiang Mai and other parts of Northern Thailand, the Loi Krathong festival also coincides with a Lanna festival known as Yi Peng, which involves the launching of thousands of fire-powered paper lanterns into the air for good luck. The sky appears to be full of burning stars, creating a dreamlike world that appears too surreal and beautiful to be real. Standing on a bridge in Chiang Mai during Loi Krathong and Yi Peng is truly unforgettable as both the Ping River and sky appear to be on fire at the same time. Adding to the beauty are perpetual fireworks displays—both sanctioned and illegal—that contribute even more fire and brilliant lights to the setting! Krathongs are small, decorated floats made from dried bread or banana leaves that are placed in the river with a candle as an offering. The intent is to demonstrate gratitude to the Goddess of Water as well as to ask for forgiveness for the pollution as a result of the celebration. Sometimes a coin is placed on the float for good luck as misfortune floats away. If you wish to make your own offering to the river, krathongs of various sizes and cost are available from street vendors for purchase. Avoid contributing to the environmental issues dealt with after a big festival by only purchasing krathongs made from biodegradable materials. Avoid those cheapies made from non-biodegradable Styrofoam. The Yi Peng festival is actually a separate holiday celebrated by the Lanna people of Northern Thailand, however, it coincides with Loi Krathong and the two are celebrated simultaneously. Colorful lanterns adorn houses and temples, meanwhile, monks, locals, and tourists launch paper lanterns into the sky. Temples are busy selling lanterns to raise money and helping people launch them. The sky lanterns, known as khom loi, are made from thin rice paper and are heated by a fuel disk. When done correctly, the large lanterns fly surprisingly high, often appearing like fiery stars once they hit peak altitude. Messages, prayers, and wishes for good luck are written on the lanterns before launch. Launching your own lantern is a part of participating in the festival. Lanterns can be purchased nearly everywhere during the Loi Krathong festival; temples sell them to tourists as a way of generating money. Light the fuel coil, then hold the lantern evenly until it fills with enough hot air to take off on its own. Don't force the lantern up or tilt it too much; the thin paper can catch on fire easily. Some lanterns come with a string of firecrackers attached to the bottom. The fireworks go wrong more often than not and drop exploding into unsuspecting crowds so watch out around the launching lanterns. Chiang Mai will become extraordinarily busy during Loi Krathong as both tourists and Thais flock to find a place to stay and participate in the celebration. Don't expect to find any deals on hotels unless you arrive very early or stay on the outskirts. Transportation will become crowded, and many roads are closed for the event. As with Songkran and other popular festivals in Thailand that draw in the crowds, you've just got to get into the right mindset and enjoy the chaos. 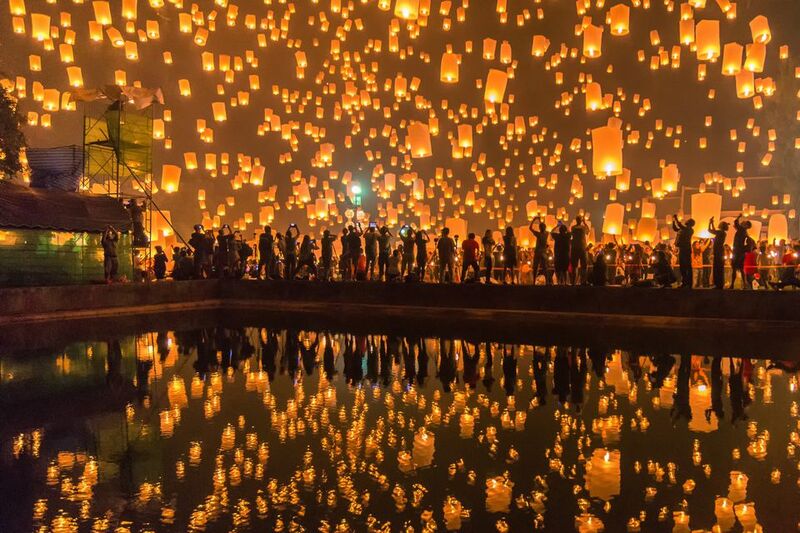 Expect the sky to be filled with fire as both glowing lanterns and fireworks mix. The lanterns fly high enough to look like stars, meanwhile, the river below the Nawarat Bridge will be filled with floating krathongs and candles. The setting is both eerie and romantic as people cheerfully celebrate the unusual ambiance. A noisy, colorful procession will pass through the Old City square before making its way through Tapae Gate, across the moat, and toward the river. Young Thais get into the celebration by firing fireworks in all directions; the constant rumble and chaos is unlike any “safe” fireworks display you've probably experienced in the West. Police have greatly cracked down on illegal fireworks. With so many additional travelers in town, the nightlife in Chiang Mai should be lively. Although celebrations of some size take place all across Thailand and even in some parts of Laos and Myanmar, the epicenter is arguably the northern capital of Chiang Mai. Chiang Mai is home to a large population of Lanna people. Fortunately, getting to Chiang Mai and also to Chiang Rai (another popular place to celebrate) is easier than ever. In Chiang Mai, a stage will be constructed at the main Tha Phae Gate on the east side of the Old City where the opening ceremony (in Thai only) will take place. The procession then moves through town, out the gate, and down Tha Phae Road toward Chiang Mai Municipality. A throng of people, many of whom will be launching their own lanterns into the sky, will be following the parade. Although much celebrating will take place around the moat, the best place to see the floating krathongs, fireworks, and lanterns are on Nawarat Bridge above the Ping River. Reach the bridge by walking through Tha Phae Gate and continuing straight down the main road for 15 minutes. After the festival, consider escaping to the more peaceful town of Pai, just a few hours north. Another great option is to head from Chiang Mai to Koh Phangan; the island should be calming down after the November full moon party has finished. Technically, the Loi Krathong festival is held on the evening of the full moon of the 12th lunar month. That means Loi Krathong and Yi Peng usually happen in November, but dates change every year due to the nature of the lunisolar calendar. The festival typically lasts around three days, although preparations and decorations are in place for a week or so before. Loy Krathong is not an official public holiday in Thailand. Most activities take place after dark. In 2018 the dates are November 21, 22 and 23. See this site for details of the Chang Mai celebrations. The release of sky lanterns is only allowed on the second and third days of the festival between 7 p.m. and 1 a.m. This year look for the sky lanterns on November 22 and 23, 2018.